The Sufi Queen Richa Sharma. Under the tutelage of Pandit Aaskaran Sharma, Richa went on to get proper training in Indian classical and light music. Richa added ghazals; film songs, Punjabi and Rajasthani folk songs to her repertoire, thus making her voice reach out to more and more people in a variety of sounds. While music was at its peak in Richa's life, academic education had to be sacrificed and without any backing with a dream to make it big in the music world, Richa landed in Mumbai in 1994. She sang cover versions and bhajans to ensure she had her bread and butter and simultaneously continued her struggle in Bollywood. She made her debut in Bollywood with Sawan Kumar's Salma Pe Dil Aa Gaya in 1996 and followed it up by a number of films until the big hit came by in the form of Taal where she sang for A.R. Rahman. Thereafter a spate of hits followed, Zubeidaa, Saathiya (A.R. Rahman); Hera Pheri (Anu Malik); Khakee (Ram Sampath); Tarkeeb (the song "Duppatte Ka Palu"), Baghban (Title Song for Aadesh Shrivastava); Soch (the song "Nikal Chali Be" for Jatin-Lalit); Rudraksh, Kal Ho Naa Ho (Sad version of the title track for Shankar-Ehsaan-Loy); Gangajal (Sandesh Shandilya); Popcorn Khao Mast Ho Jao (Vishal-Shekhar), Saawariya (Monty Sharma), and Om Shanti Om (Vishal-Shekhar) and the most popular song for Kaante ("Mahi Ve" for Anand Raaj Anand). The versatile playback singer has also done quite a few albums to showcase her talent. 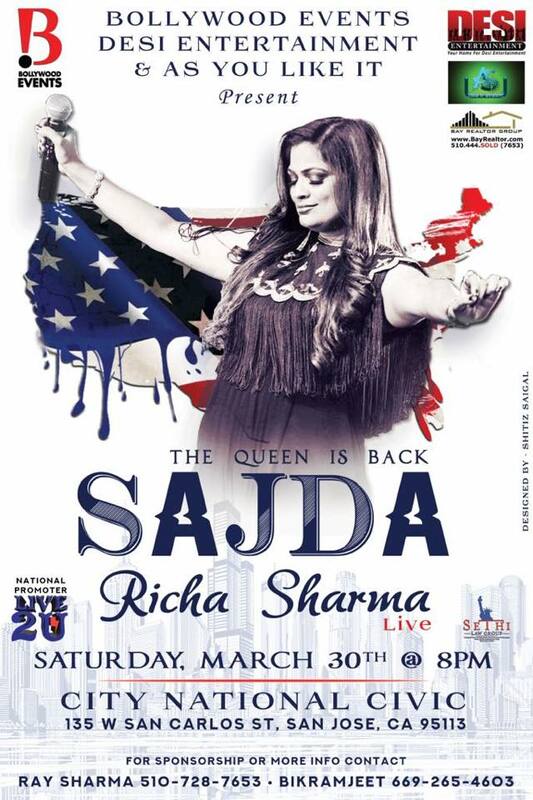 Albums like Ni Main Yaar Nu Sajda Kardi, Piya and Winds of Rajasthan (for Times Music released early 2004) have brought out the classiness and grace in Richa's voice and her versatility as a singer. In March 2011 Richa Sharma and her family inaugurated Saibaba Temple in Faridabad, Haryana and launched her first Saibaba devotional album Sai Ki Tasveer released by SaReGaMa India.